Since 1986, Diversified Decorating Sales, Inc. has been manufacturing the highest quality pad transfer printing pads, doctor blades, and peripheral pad printing supplies. We offer our customers the most diverse silicone printing pads in the Pad Printing industry! Our printing pads and related printing supplies have been qualified throughout a vast majority of industries including: Electronics, Biomedical, Recording, Automotive and Plastics. The Pad printing industry uses our pads to decorate such items as compact discs, integrated circuits, syringes, and numerous injection molded components. 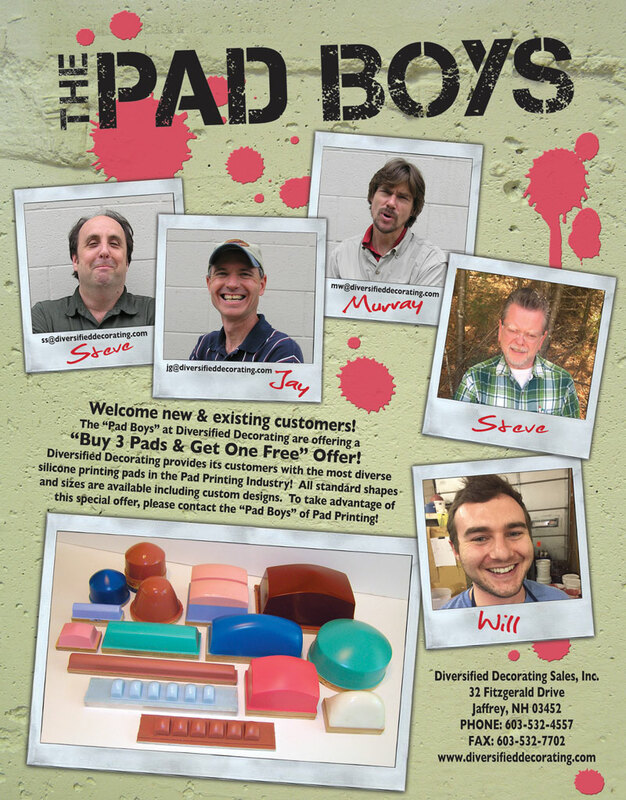 Contact the PAD BOYS of PAD Printing at 603-532-4557! Copyright Diversified Decorating Sales, Inc. All rights reserved. Site by LEA Designs.